Our modern life is based on organising an environment free from the unexpected. The house needs to be as stable and reliable as possible. The job as safe as possible. Nothing should break down. Nothing but what we predict, should occur. This is the life of the zoo animal. Let's explore the life of the Nomad. Let's live the life of the Nomad. The failure of the engagement had left me bereft of word and aspiration. Unlike most of the other relationship failures, I had to conclude this one was down to me - or rather, something missing within me. Here I was - Broken. Not fit for a relationship. Now this does sound depressing but really it was quite liberating. No longer a need to indulge myself in thoughts of normalcy, I was free to be whatever a man with something broken inside is supposed to be. I could do whatever I wanted whether it was healthy or not - and mostly it was not. No need to pretend anymore that I was part of the living and thriving human community. A teacher in primary school had displayed to us a picture of a man in a striped black and white prison outfit. This man, she explained, was a man not fit for the community of the good. I was no prisoner but the metaphor holds. I could now do my own thing like the Imperial Zebra in my black and white covering. The horses could gallop among themselves. I started attending a Pentecostal black church. I had always had a belief in the divine to a stronger or lesser degree. Each Sunday the preacher, whose name was Pastor Andrew, would bellow and shout, scream and proclaim the word of the gospel.
' This church is a hospital for the spiritually sick' - he would shout. 'You are more than conquerors' - he would bellow. 'The Lord has a plan for you' - he would scream. As bizarre as all this sounds - it began to work. My inner strength returned. My mental strength returned. For instance, I decided to achieve a Microsoft certification at the highest level. I completed it. I decided to exercise again - and began cycling 15 miles each day. I could feel the Holy Spirit working through me: returning me to an equilibrium that I believe doctors call homeostasis. And so I decided I also needed to start the blog back up again. I needed to take another journey and write about it. I had already climbed the three highest peaks in England, Wales and Scotland. 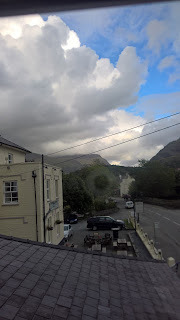 I had blogged about Scafell Pike in England. I had blogged about Ben Nevis in Scotland. This left Snowdon in Wales. 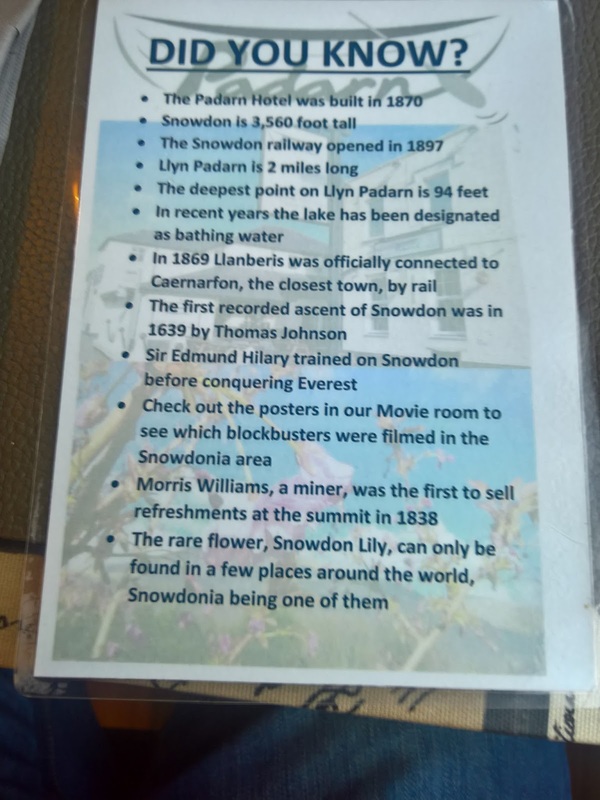 I have hiked to the summit of Snowdon at least a dozen times in the past - and have used various routes. The least challenging from a navigational point of view is the Llanberis path. The path generally follows the train track that also leads to the top. The path is easy to follow - but it is a demanding 10.5 mile hike. The weather forecast was not ideal. There would be rain, mist and wind. I didn't fancy a challenge with the maps and the compass. I decided to take the Llanberis path. Llanberis is perhaps my most favorite little village in the United Kingdom. No matter the time of the year it is always raining; however as soon as the clouds lift the surroundings are spectacular. 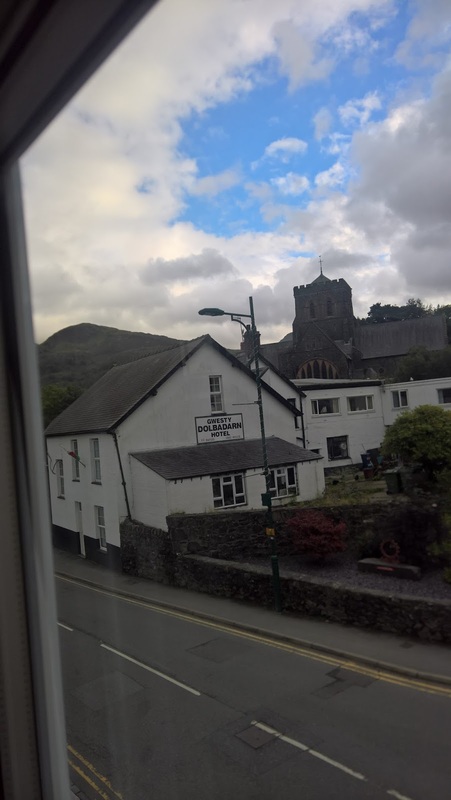 The Dolbadarn Hotel - My regular weekend residence many years ago. Pete's Eats - popular with climbers from all over. A mountain hike should begin with a breakfast high in calories. The traditional English breakfast is ideal. 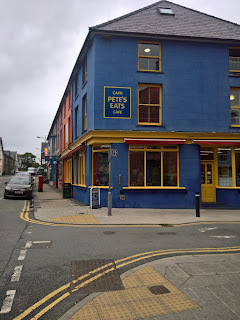 I was staying at the Padarn Hotel and the breakfast of sausage, egg, bacon and tomato was ordered. 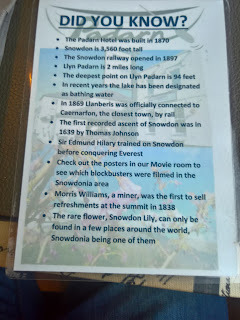 On the back of the breakfast menu the proprietors had thoughtfully listed some of the interesting facts about Snowdonia. After consuming this delicious meal I collected my backpack, exited the hotel, and began the hike. The entrance to the Llanberis path is easy to find. You only need to locate the Snowdon Summit train station, continue along the road and turn right at the first round about. A steep road leads to the start of the path. It was raining and so I had to put on my weatherproof trousers and jacket. With this additional clothing and the steep road, I felt rather hot and exhausted before even reaching the start of the trail. The start of the path is sign posted on a triangular rock in keeping with the environment. It is probably not easy for those who have never hiked up a mountain to understand why thousands put themselves through such a physical torture - each day of the week. For me the activity has three positives. Firstly it is a healthy form of exercise. Secondly it is an escape from civilization and a connection back to a more natural, if extreme, environment. Thirdly it is a form of meditation. The only way to complete seven tough hours of mountain hiking is to concentrate on each step and let the trivial stresses and anxieties of everyday life dissipate from the film of your consciousness. If this is done correctly - and it does take practice; it is possible to achieve the summit and experience the elation of this achievement. The summit of Snowdon is elevated to 1085 meters. As you approach the last 200 or so meters of elevation the tangents steepen; and the weather can worsen rapidly. There is a temptation to remove layers of clothing through sheer exhaustion - but this is a mistake. If the wind is up and the weather is cool - you need to retain your body heat otherwise exposure will take you down very quickly. Near the top it is also tempting to feel envious of those who took the easy way up. The train was steam driven - and the fragrance of burning coal and steam, and the sounds of this old form of locomotion, in the cold mountain air, were wonderful. Nearing the summit visibility was reduced to around 15 meters. I cannot say I enjoy hiking through the blanket of thick cloud. It is very easy to become disorientated and there is a feeling of being deprived of a summit view - after all that hard effort. But even so there is still the elation of success when the summit is reached. I didn't linger long on the summit. The extreme cold began to bite fairly quickly and my limbs were feeling numb. And thus I commenced the long hike back down to the mountain's base. I had purchased hiking shoes in my normal size the day before, without trying them on. This was a silly mistake. The shoes were slightly too big, and going down in such shoes caused me quite a bit of pain. It was indeed a relief to make it back to the hotel. I was completely spent and dehydrated. All I could do was lay down and rest - there was no energy left and my head was throbbing with the day's effort. I drove back the next day in the Suzuki. This would be my last big trip in the little old car. I would soon be trading in the reliable old machine for a new car - and I had a strange feeling of sadness. As if the car had its own feelings and personality. I think this phenomenon is called animism. 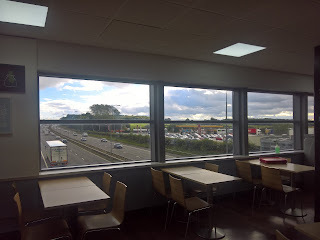 It is quite a long journey from the North of Wales back to Hayling Island - and on this day it took me seven hours. 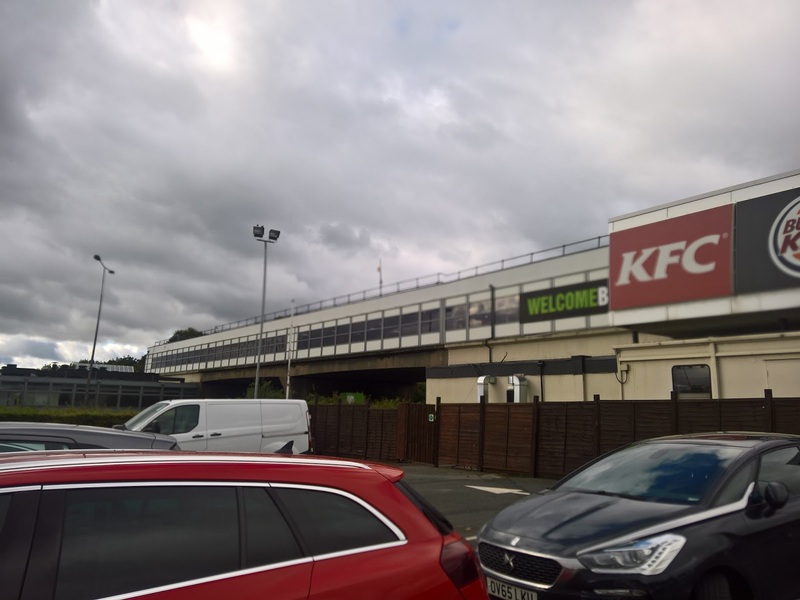 I stopped at the Keele services on the M6 at junction 15. 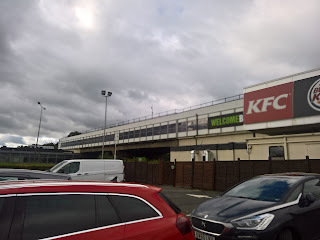 I do find these services, that span across and over the motorway, fascinating. They were built at a time when motoring was glamorous. I can imagine an era when it was a notable event: to drive out in your shining vehicle, and wearing your finest clothes, and parading the results of your labour, in such a glamorous service stop. And so this was my journey to Wales and my hike up this famous mountain. I hope to continue the trend with more hiking and more blogging. And I hope you all will join me in the adventures still to come. So nice to see you blogging again - it's been a while. And it's great that you are getting out and about again after the disapointment of your relationship. Do keep travelling and writing.